It started with a simple trip to a local food store to grab a cup of hot chocolate on an unusually cold morning a few weeks ago. I was standing in a short line to pay for my drink and a small snack. When I approached the cashier to pay, she smiled, nodded towards the man who was ahead of me on line and said to me “he took care of this for you, have a nice day”. I turned quickly and saw the smiling face of someone about my age as he was heading out the door and called out to him: “ Hey, you didn’t have to do that but awfully kind of you, Thanks!” He shouted back: “ Thank you is wonderful to hear, pay it forward”. Ahh, yes, that put a smile on my face too. As I went about my day I told everyone that story and asked if they had ever given or received such a gift. It was more common then I would have thought, as random acts of kindness definitely happen. I was glad it was my turn to be on the receiving end that day! While we can’t control when we might be the recipients of kindness, we can control when and how we show it to others. The gentleman in the food store said to me: “Thank you is wonderful to hear, pay it forward”. So, I decided not to overthink this. Keeping it simple by being thankful and expressing your thanks more often are great ways to build a Thank You habit. This can be contagious and help you and others in many ways. This week is Thanksgiving where many celebrate the tradition of giving thanks. With its origins in the early 1600’s, it is a time that takes on a special meaning for families and individuals. I recall all the Thanksgiving pasts with fond memories of family and friends highlighted by two words: “Gratitude and Gathering”. Being truly grateful to others and expressing that gratitude can help us grow in both mind and spirit, especially as we age. It can help us be more open, happy, accepting of new things and make sharing and learning from others easier. This is an important element in order to continue to grow in our retirement years. So what are you grateful for, and I don’t necessarily mean from a gift you received? I suggest we explore reasons to be thankful across the spectrum of our lives, not just in one area. Perhaps this question will stir your thinking. For what are you grateful in the following areas? In order to build a Thank You habit, simply be aware and in touch with the present moment. 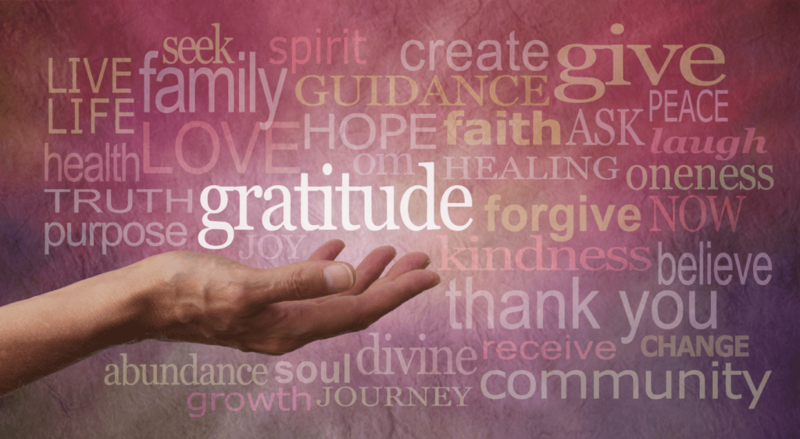 When you truly experience a feeling of gratitude, then smile and say thanks! This can be difficult when we are distracted and busy. It takes a little practice, but by looking for the opportunity in the present moment you can make your day and someone else’s. Is there someone you want to say thanks to? What are you waiting for? Don’t over think this. Perhaps someone did you a favor, taught you something, gave you a break, gave you a hug when you needed it, helped someone close to you, shared his or her time with you, called you to say hi OR just bought you a cup of hot chocolate and a snack on a cold morning. Thank you is a wonderful gift to give back! Thank you for reading all my blogs and for the comments I received on them this past year. Have a great Thanksgiving!